There are a variety of races of Orcs. The five main breeds are Common Orcs (Shaguk-m�m), Scrug Orcs (Shaguk-m�r), Greater Orcs (Shaguk-c�r), Vard Orcs (Shaguk-w�), and Grey Orcs (Shaguk-g�l). All Orcs share certain characteristics in common. They have a clan structure and live underground most of their lives. They have brutish faces which look like a grotesque parody of the Elves. They have good musculature and brown hides for skin. Although they typically run long on strength and short on smarts, Orcs come in wide varieties of ability. Often thought to be very primitive, Orcish societies have an organized structure, goals, and develop very well made tools and weapons. They have even developed cultural expressions in art and science (although, the arts and sciences have particularly Orcish things for their subjects -- an Orc Bard is to be greatly feared in his own way). They generally hate everyone else except other Orcs, and they're not too keen on most of them, either. They especially hate the Elves. What follows are general overviews of the various races for players in Shagrat's Lair. More details of a particular race will be given to players of that race. 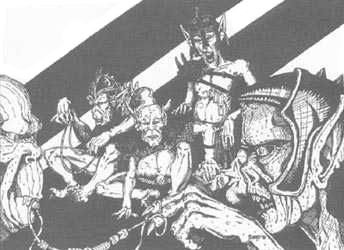 All descriptions are taken from Races and Cultures: Underground Races, �1996 Iron Crown Enterprises, Inc. The Common Orcs, or Shaguk-m�m, are the smallest and least organized of the Harsh Folk. Called by many the Least Orcs, these Shaguk combine all of the worst qualities of the various Orc breeds with few of the better ones -- not that any are good in any sense, but many Orc breeds have some semblance of social discipline. Common Orcs are the most barbaric, practicing cannabalism on one another, infanticide on their young, and fratricide within their own clans. Only the strongest of wills and most dominant of personalities can command them, but they make excellent fodder for evil war bands, and much like a rat will fight ferociously if cornered. Male and female Common Orcs average approximately four feet in height. They are heavy, with short, thick legs and long, thin arms. They have grotesque faces seemingly set in a permanent snarl, with upward thrusting lower teeth that dominate their mouth, visible even with lips together -- not quite the tusks of the larger Shaguk-c�r, but impressive nonetheless. Their hair growth is random and unkempt, often bristly, adding to their disheveled and ugly appearance. Much like their stronger cousins, they have a loping gait caused by their unbalanced length of leg to torso. Many laymen will often confuse Common Orcs with Goblins, due to some similarities of build, but the attentive eye will distinguish between them -- and which of them is more dangerous. A variant strain of Common Orcs, the Scrug Orcs, or Shaguk-m�r, are physically the most powerful of all Orcish breeds. Their strength is considerable, as is their size. They dwarf the Shaguk-c�r, often being mistaken for Ogres or even Trolls at a distance. They lack the personal initiative and drive to lead Orc clans, which they could clearly do, given the Orc tradition of rule by whomever can butcher the contenders. Scrugs have no regard for the lives of any other creature, including other Orcs. In this, they are even worse than their fellow Shaguk, for the Shaguk-m�r simply have no care. They are heedless of any injury they cause, as other creatures simply are not worth their notice. Scrugs are almost always fighters. The Shaguk-c�r, Greater Orcs, are the largest of all the Harsh Folk, excepting the Scrugs. They are stronger and smarter than their Common Orc kinsmen. They are found in self-governing societies with their own intents and purposes, most of which revolve around the pursuit of bloodshed and slaughter. Greater Orcs can be found in virtually any clime, preferring temperate areas and caverns underground, but well able to prosper in bitter cold, fetid swamp, or bleakest desert. Greater Orcs stand between five and six feet tall, with longer, stronger legs and thicker arms than tier Common Cousins. They are less bowed when they walk than their lesser kin, but their build still lends a loping quality to their movement. Shaguk-c�r have long, barrel-chested torsos defined by large, bunchy chest and shoulder muscles. Greater Orc hides are naturally thick, tough, and leathery, but have a surprisingly smooth texture (except for the warts, scars, and random patches of rough, mangy hair that mar them). Their cruel, slanted eyes gleam with feral cunning. Greater Orcs have much wider mouths than the Common variety, with heavy, forward-thrusting jaws and huge, generally upward-pointing, sharpened tusks. The Vard Orcs are a rare, variant strain of Greater Orcs. They are virtually identical to the Shaguk-c�r in every respect, save for one important difference -- they have four arms. The Vard Orc language, physiology (with that notable exception), religion, appearance, demeanor, and other social aspects are all consistent with both Greater and Common Orc norms, though more dangerous in a fight. Vards may use their four arms without appreciable difficulty, utilizing four weapons, two shields and two weapons, etc. They may have any obvious combination, especially when combining melee weapons with missile weapons or pole arms. Vard Orcs, or Shaguk-w�, make especially deadly archers, for they may simultaneously ply their bows and defend themselves. An even more damaging possibility is that of a troop of Vard archers bearing a pair of bows each. It is because of their unmatched potential in combat that they hold such a respected (i.e. feared) place among races of their ilk. Grey Orcs are among the most dangerous of all Orc kind, for the Shaguk-g�l (their name for themselves and among others of the Harsh Folk) are adept as none of their kinsmen are at the working of magic. True, some other Orc folk may make conjury, but none possess the innate ability of the Grey Orcs for true sorcery. While they are actually more closely related to the Common Orcs than any other, the Shaguk-g�l are practically a breed unto themselves. They mix freely with Orcs of all other kinds, often dominating their kindred with hideous sorceries and dire necromantic conjurings. Intelligent and dark-hearted, the Grey Orcs practice virtually all professions but tend towards those of Sorcerer, Cleric, and Magician. Grey Orcs, like their Greater and Common cousins, possess heavy musculature and thick, rough, hide-like skin. They tend to be long in arm and torso, but also have longer, straighter legs than their brethren of Common lineage. They share the barrel-like torso of their Greater kin, yet the Shaguk-g�l walk with no hunch in their stride, and their posture is straight. The head of a Shaguk-g�l is not quite as slope-browed or slack-jawed as that of a Common Orc, and their cheekbones tend to rise slightly higher than other breeds. The faces of the Shaguk-g�l, like all of their species, are sharp and grotesque, having thin-lipped, sharp-tusked mouths and blunt, upturned noses. Grey Orcs are often thought to be the link between the Common and Greater varieties; being a step up physically from their Lesser kin, though hardly on par with massively powerful Shaguk. Their higher intelligence, however, is more than adequate restitution for any size differential.